In microtidal seas such as the Mediterranean (tidal range ≈0.4 m sea-level indicators are commonly used to infer coseismic history. A list containing these indicators is long, including wave-cut platforms, marine terraces, displaced beach rock, biological agents, sedimentological and stratigraphical indicators, and archaeological indicators. Obviously, the trustworthiness varies a lot from one to another. For deriving late Holocene coastal tectonic activity, one of the most commonly used sea-level marker activity are tidal notches. These form distinct morphological and ecological erosional features developed within the tidal range [Pirazzoli, 1986; Antonioli et al., 2015]. Fig. 1: Notches in Greece. a) a tidal notch raised ~1 m from mean sea-level by the 365 A.D. Hellenic Earthquake. b-d) tidal notches along Perachora Peninsula in the eastern Gulf of Corinth. Nice examples of tidal notches can be found along steep neritic limestone cliffs and are best preserved where they are sheltered from wave action. The idea in palaeoseismology is when equivalent older features (older than the recently forming one) appear different from the present-day sea-level coseismic activity can be inferred. However, a direct correlation of individual tidal notch levels to palaeoearthquake parameters is still an outstanding challenge especially in rifting regions. 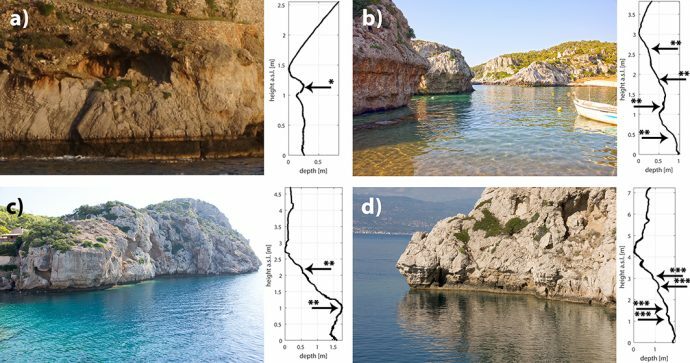 For example, the shoreline of western Crete was uplifted by up to 9 m during the compressional M8.5 Hellenic earthquake in 365 A.D. [Shaw et al., 2008] (Fig. 1a). Now, this shoreface forms a classic example for a lifted prominent strandline as a consequence of rapid emergence. This distinct palaeoshoreline is well-preserved and has not been affected by wave attack or midlittoral erosion. By contrast, shorelines that experienced rapid emergence due to extensional tectonic movements, such as those from Perachora Peninsula in the Gulf of Corinth (Fig. 1b-d), are not likely to preserve fully developed tidal notches. In these settings, the amount of coseismic displacement is usually up to an order of magnitude lower than in megathrust events, and moreover the uplift component is estimated to be only 1/4 to 1/2 of the net slip per earthquake (e.g. Papanikolaou et al., 2010) and thus not likely to exceed the tidal range. As a result, the former and new erosional zone along the cliff would overlap, overprinting the earlier notch. Depending on the time and vertical displacement, the resulting shape is tantamount to a widened single notch; due to the tidal range variation. Only at close range minor variations will be detectable on the surface curvature and normal to the orientation of the roof (Fig. 2). Fig. 2: a) Zonation of a simplified tidal notch (R, roof; F, floor; IP, inflection Point). b) Evenly distributed erosional potential pointing at mean sea-level causes a symmetrical shape of a tidal notch (I). When the erosional zone gets offset by an earthquake (II–IV), the level-based erosional potential attacks the prior to this created cliff morphology (III). The resulting shape comprising two notch generations (1 and 2) exhibits patterns of convex or concave curvature (c). d) Visualisation of the estimate of the normal vector (N) at any point (P) along a normal section from principal curvatures k1 and k2. 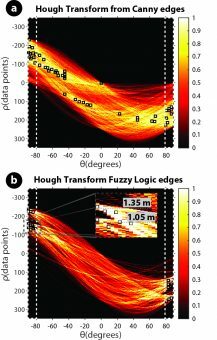 It turned out that our custom fuzzy logic approach performs better for the purposes of tidal notch characterization than the conventional Canny detector. 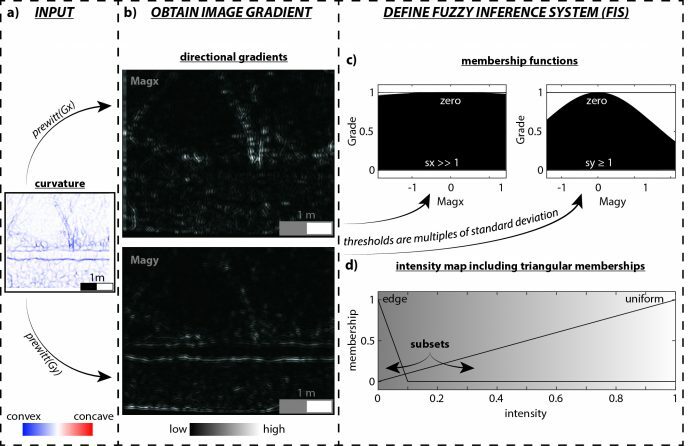 In particular, the output from the Canny detector is a binary image whereas the fuzzy logic approach produces a gradual intensity map including a sensitivity for horizontal directional gradients (Fig. 3). In order to evaluate the detected edges – which are still individual cell values – we perform a Hough transform at the end of the workflow. 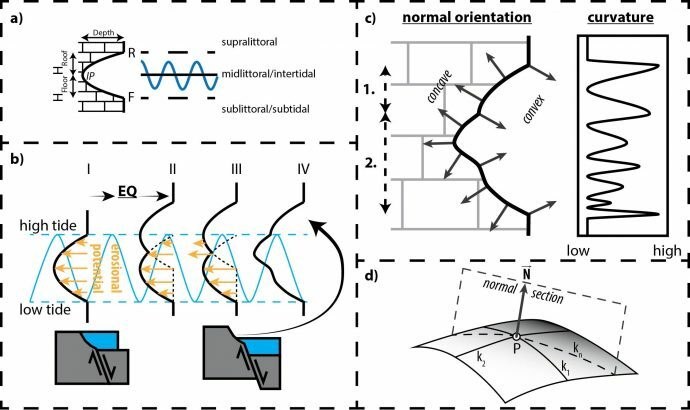 The main idea of a Hough transformation is to find imperfect instances of objects representing continuous line features by a voting procedure (Fig. 4). For this procedure image objects are compared to the parametric term of a straight line. In other words, the Hough transform allows evaluating the existence of continuous morphological remnants. Fig. 4: Hough transform from detected edges. Dashed areas indicate potential line features with absolute θ > 80°. Peaks in the normalised voting map (squares) represent parameters for most likely lines. Zoom indicates to peak cluster of almost horizontal oriented line features corresponding to elevations of the notch’s roof and floor, respectively. 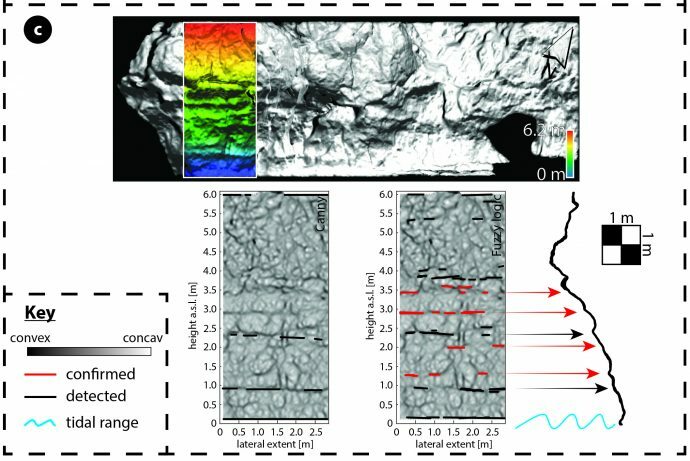 The workflow does not only produce good results for distinct tidal notch morphologies, but has proven robust also for overprinted and degraded cliff faces (Fig. 1b-d & Fig. 6). Fig. 6. Results of testing methods along coast of the Perachora Peninsula. Red arrows indicate the position of the roof of known notches. Black arrows point at morphological characteristics that could correspond to new notches. Interestingly, the workflow does not only provide a more objective evaluation of already identified palaeoshorelines, but also provides evidence for additional horizontally continuous morphological expressions in between. As a consequence, if the additional levels become proven palaeoshorelines the average displacement is reduced to a more likely value with respect to common coseismic slips in extensional tectonic settings. Hence, there is probably no longer a problem with metrescale displacements and derived palaeomagnitudes since undiscovered notches in between major emergence can be recognised. Therefore, we show that TLS combined with up to date post-processing edge analyses can form a rigorous and useful approach to the interpretation of palaeoseismic records from Holocene tidal notches. Antonioli, F.; Lo Presti, V.; Rovere, A.; Ferranti, L.; Anzidei, M.; Furlani, S.; Mastronuzzi, G.; Orru, P.E. ; Scicchitano, G.; Sannino, S.; Spampinato, C.R. ; Palgiarulo, R.; Deiana, G.; de Sabata, E.; Sansó, P.; Vacchi, M.; Vecchio, A. (2015): Tidal notches in Mediterranean Sea: a comprehensive analysis. Quaternary Science Reviews 119, pp. 66–84. DOI: 10.1016/j.quascirev.2015.03.016. Papanikolaou, I. D.; Foumelis, M.; Parcharidis, I.; Lekkas, E. L.; Fountoulis, I. G. (2010): Deformation pattern of the 6 and 7 April 2009, MW=6.3 and MW=5.6 earthquakes in L’Aquila (Central Italy) revealed by ground and space based observations. In Nat. Hazards Earth Syst. Sci. 10 (1), pp. 73–87. DOI: 10.5194/nhess-10-73-2010. Pirazzoli, P. A. (1986): Marine notches. Orson van de Plassche (Ed. ): Sea-Level Research. Dordrecht: Springer Netherlands, pp. 361–400. Schneiderwind, S., Boulton, S. J., Papanikolaou, I., and Reicherter, K. (2017). Innovative tidal notch detection using TLS and fuzzy logic: Implications for palaeo-shorelines from compressional (Crete) and extensional (Gulf of Corinth) tectonic settings. Geomorphology (in press). DOI: 10.1016/j.geomorph.2017.01.028. Shaw, B.; Ambraseys, N. N.; England, P. C.; Floyd, M. A.; Gorman, G. J.; Higham, T. F. G. et al. (2008): Eastern Mediterranean tectonics and tsunami hazard inferred from the AD 365 earthquake. Nature Geosci 1 (4), pp. 268–276. DOI: 10.1038/ngeo151. PhD in earthquake geology. Used to work in coastal tectonically active regions such as the Gulf of Corinth (Greece) using terrestrial laser scanning and other fancy instruments. Now, working for an IT-Service supplier in the insurance industry.